RIO DE JANEIRO, BRAZIL – The organizing committee of the Rio 2016 Olympic Games and the Brazilian Micro and Small Enterprises Support Service (Sebrae) have entered into a partnership to help small Brazilian businesses win contracts to supply goods and services to the 2016 Olympics. 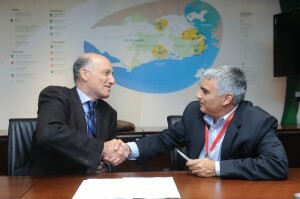 Rio 2016™ CEO Sydney Levy and Sebrae Managing Director Cezar Vasquez during the signature of the cooperation agreement, photo by Andre Telles/Sebrae. The agreement, called “Sebrae on the Podium”, is aimed at micro and small businesses across Brazil. 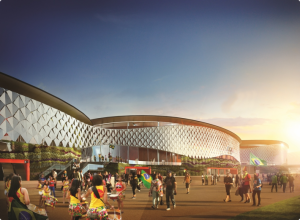 Sebrae will work with businesses to help them to meet the qualification requirements to win contracts directly with Rio 2016 and with the major contractors appointed by Rio 2016. This will be done through rounds of meetings with Rio 2016, the major contractors, and potential suppliers wishing to win the contracts. The first round of contracts to be discussed will include those for printing, laundry services, uniforms, and housing modules. Artist rendering of the three pavilions that will become the country’s first Olympic Training Center, photo by EOM/Rio 2016. While helping small businesses compete for the Olympics’ contracts, the agreement is also intended to leave a lasting legacy after the games by improving Brazilian enterprises’ competitiveness. One such entrepreneur who received guidance from Sebrae in establishing his business in Rio is Charlie Crocker of Piso Plano Design. Sebrae’s initiative with Rio 2016 complements other work it is doing in relation to major sporting events in Brazil. This week it is holding talks in São Paulo on how small businesses in the creative industries can win work related to the 2014 football (soccer) World Cup. Did you like this article? As an independent community news publisher we need advertising and reader support. Please consider making a US$10 or US$50 donation, or buy one of our new T-Shirts online (which provides US$5 to The Rio Times).